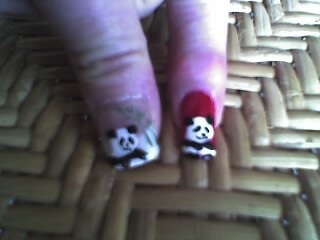 jDo they call this a “Pandacure”? We had our nails filled and painted by a very talented nail technician today. She did an acrylic fill entirely by hand with only files and buffing pads. No grinders!! Cute… so we are on-line close to the sametime! They are just showing a picture of Hwy 14 north of Marshalltown on KWWL. The drifts are higher than the pick up trucks! What a beautuifull place I bet you have lots of stories to tell. You two should go on tour and give talks and show pictures if Thailand around the local cummunitys. Hi All-we sent the pictures while we were having dinner-then when we got back to the Baan Orapin, we are now able to post to the pictures that we just sent. It is a Buddhist Holiday here, so no alcohol is served in any restaurant–not that we care–you would think that people wouldn’t go out—-NOT THE CASE AT ALL. We were early tonight for dinner so got seated right away, but when we left, the place was packed. There is a Wat (Temple where Monk’s live) right next to our bed and breakfast. At this very moment, they are chanting and people are paying respect to Buddha-flowers-incense- candles. It is very beautiful. The people are filing into the temple carrying these items of respect and the cats are trailing with their tails waving in the air. We are heading back to the room to pack our things for our 5:30 AM pickup tomorrow. Plane leaves at 7AM.